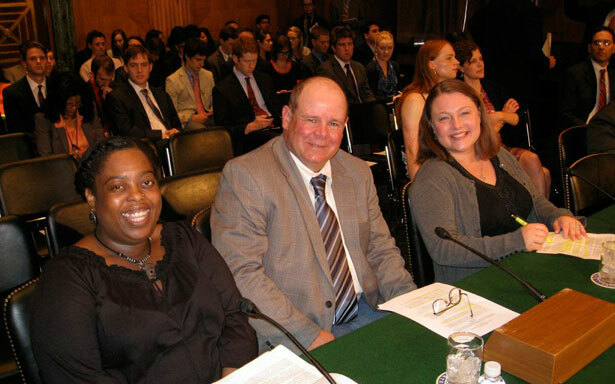 Three Oregonians testifed in the Senate about the lives of the working poor and the state of the American Dream. Diedre Melson, John Cox and Pamela Thatcher. Credit: Don Mathis. Yesterday, Senator Jeff Merkley (D-OR) got off to an auspicious start as chair of the Banking Subcommittee on Economic Policy by doing something that is all too novel—inviting people with the most at stake in economic policy decisions to testify in Congress. Senator Merkley set the context with some powerful and totally depressing statistics, including that between 1989–2010, hourly productivity grew more than three times as fast as wages did during that time; the bottom 20 percent of wage earners saw their average hourly wages decline by thirty cents; the next lowest 20 percent saw their earnings decline by 4.3 percent. In contrast, over that same period, the top 20 percent of workers enjoyed a nearly 30 percent increase in earnings. “The data seems to suggest that ordinary families have been slowly hurting for a while, the financial crisis and recession nearly crushed them and our budget austerity policies are making it even worse,” said the Senator. Certainly the witnesses from American Winter agreed with his analysis. Diedre Melson started working at age thirteen and, after graduating high school, enrolled in college. But after two and a half years she could no longer afford it, and so she transferred to “a career school” where she was certified as a medical assistant, cardiac technician and phlebotomist. She obtained a good job at the Alpha Plasma Clinic but was laid off along with 1,500 other workers when it was shut down during the recession. She was unemployed for two years before finding minimum wage work, and she received SNAP (food stamps) and housing assistance. But even with this assistance, she needed to sell scrap metal—as well as her plasma once or twice a week—to support her four children, two of whom are in college. She now works full-time for the 211info social services hotline and earns $13.50 an hour, but she still must turn to SNAP assistance to feed her family. Melson said she is frustrated with media that “exploit” instances of abuse of the safety net rather than showing the vast majority of people who turn to it in the midst of a financial crisis. Cox paid his way through college—which he noted was much cheaper then—working various jobs, including commercial fishing in Alaska, and sweeping volcanic ash from parking lots after the eruption of Mount St. Helens. “I hadn’t been without a job since I was about 12 years old—until October 2008,” he said. That’s when he was laid off from his position as an accountant. He was confident he would be rehired quickly, but ended up exhausting $35,000 in savings and $35,000 in his 401(k) to support himself and his 12-year-old son, who has Downs Syndrome. “After the dreaded six months of unemployment, employers won’t look at you. They’re not anxious to hire a person of my age anyway,” said Cox, who is in his 50s. Pam Thatcher and her husband saved up before having their first child so that she could stop teaching preschool and work as a stay-at-home mother. But after they had their second child, her husband was laid off. Her husband has found a new job, but like so many other workers, he is earning a much lower salary than he was before the recession. “Now, even with full-time work, we still struggle to make ends meet,” said Thatcher. The panel’s public policy experts—Princeton economics professor Dr. Atif Mian, Demos senior policy analyst Amy Traub and venture capitalist Nick Hanauer—suggested many reforms to help rebuild the middle class, including raising the minimum wage to $15 per hour, investing in public education and reducing student loan rates to make college affordable, rebuilding the right to organize and collectively bargain and insisting that the wealthy and corporations pay a fair share of taxes as they did in the past. Mian, Traub and Hanauer did an excellent job laying out the economic trends that are diminishing the middle class, and proposing ways to reverse these trends. But it was the voice of the people—represented by three Oregonians—that made this hearing so meaningful. Kudos to Senator Merkley for making that happen. I candidly think it will take 1,000 Diedres, Pams, and Johns doing sit-ins in congressional offices—along with other advocates for the poor and the middle class—to create the kind of change that is needed. But in the meantime, Senator Merkley opened the door to authentic experience in his subcommittee, and I hope he will keep it open. “New Perspectives on Transforming States’ Health and Human Services,” Olivia Golden et al. Thank you, James Cersonsky: James’s insights and writing made this blog better in recent months. He now turns to focus once again on his own reporting, which you will definitely want to follow. “Keeping Kids in School and Out of Court,” New York City School–Justice Partnership Task Force. Though violence in New York City schools dropped 37 percent between 2001 and 2012, the number of suspensions in the latter half of that period shot up 40 percent. Using city data and task force findings, this report maps the landscape of punitive discipline. For example, it finds disproportionate suspension of special needs students and (increasingly) disproportionate suspension of students of color—in line with well-documented national trends in school discipline. Moreover, a relatively small group of schools account for the lion’s share of suspensions, summonses and arrests and most suspensions are for relatively minor incidents. The report offers sweeping recommendations for overhauling the system: a citywide initiative convening agencies, community-based organizations and unions that commits to informing policymaking with data; a graduated response protocol for student conflicts; across-the-board expansion of positive discipline supports; reduced reliance on suspensions and arrests; and improved educational planning and reengagement for youth in court or jail. “Working Hard, Left Behind: Education as a pathway from poverty to prosperity for working Californians,” the Campaign for College Opportunity and the Women’s Foundation of California. More than 40 percent of Californian children under the age of 18 are in low-income working families—a tough lot, as California ranks last in the country in the percentage of these families with high school degrees. Drawing from a large body of research, this report charts the reasons for the deficit and the policies needed to ensure quality education for this population. For one, nearly two-thirds of the state’s 24 million adults between the ages of 18 and 64 are people of color—who are thrown behind by a variety of systemic factors—and this proportion is much larger for younger segments of the population. California also boasts major deficits in higher education financial aid and state-subsidized childcare programs relative to need. The report proposes improving linkages between different parts of the educational pipeline, strengthening programs that provide basic skills and remedial education, bolstering financial aid and other resources and drafting a public agenda for higher education.